More and more consumers are embracing local food (farm to table) and sustainable business practices. This is a positive consumer trend that will continue to catch on in the future. However, there is one group in Albany, New York that has been a category leader for years. Honest Weight Food Co-op has been promoting natural and local food for over 35 years. 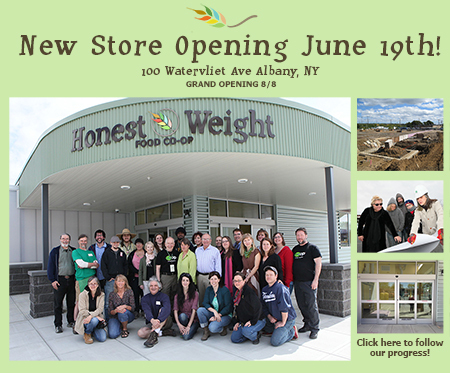 On Wednesday, Honest Weight moved into a new larger location at 100 Watervliet Avenue in Albany. The new location comes with 150 parking spaces which eliminates one of the major drawbacks of the previous location. Retail space has doubled and members and consumers are treated to a great shopping experience with spacious aisles and compelling food displays. Local, natural and sustainable food shopping has come of age. It is a pleasant upgrade from the typical grocery store experience. Many educational events are planned and a grand opening is scheduled for August 8th. The Honest Weight Food Coop is an organization owned and operated by its members. Its main purpose is to supply high quality natural foods at low-cost to both members and non-members and to bring people together through cooperative action. Active members work three hours per month and receive additional discounts. Honest Weight has over 8,500 members. Honest Weight offers produce, meat and other grocery products. Many of the products come from local farmers and producers. Honest Weight defines local as within 250 miles of the Co-op. Honest Weight spearheaded the natural and local food movement in the Capital District. Honest Weight began in 1976 as a small buying club with about 20 people, working out of Sharon and Gary Goldberg’s basement. Its member-owners took turns collecting, collating, and processing monthly member orders. It was the first buying club in Albany, making healthy, nutritious foods accessible to all of its member-owners. Honest Weight Food Co-op opened to the public in 1977 as a cooperatively owned and operated natural foods grocery store for New York’s greater Capital Region. Since that time their mission has always been to provide high-quality, affordable, natural foods to our member-owners and to the regional community. Honest Weight promotes more equitable, participatory and ecologically sustainable ways of living. Their community embraces cooperative principles, shares resources and creates economic fairness in an atmosphere of cooperation and respect for humanity and the earth. Honest Weight is dedicated to a “triple bottom line:” People, Planet, Profit. Have you ever shopped at a natural food coop?